Popiah is a Fujian/Chaozhou-style fresh spring roll that is common in Taiwan, Singapore, Malaysia and Burma/ Myanmar. The skin of the popiah is usually made of flour, it is a thin (and soft) paper-like crepe or pancake is used to wrap cooked sliced vegetables (e.g. grated carrots, slices of Chinese sausage, thinly sliced fried tofu, chopped peanuts or peanut powder – there are slight variations), eaten together with sweet sauce and (optional) chili sauce. Once the sauces and ingredients are placed on the popiah skin, the skin is wrapped into a roll – all the yummy ingredients nicely tucked inside. The roll is then sliced into 5-6 pieces. Just think of popiah skin as an extremely thin version of a taco wrap (not exactly, but similar). Popiah, on its own, is not very filling unless you have a small appetite or eat a lot of it! It’s nice as a snack tough. I happened to eat popiah yesterday with a couple of friends at Toa Payoh Loyong 7, and it was nice. The popiah stall at Toa Payoh Loyong 7 (Long House Popiah) uses homemade popiah skin with fresh ingredients. 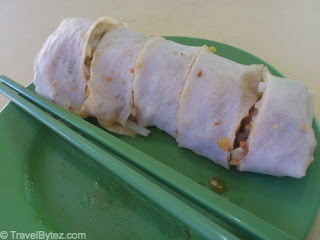 The added ingredients give it a crunchy taste, while the popiah skin is soft and not dry. The amount of gravy that comes with the cooked vegetables is just nice; it does not make that popiah skin soggy. Speaking of popiahs, the popiah at Qi Ji Suntec City Mall is not too bad too. You can even buy back popiah skin from stalls or supermarkets and have your very own popiah party. There are even carters that will provide you with the ingredients for your party so all you have to do is wrap and eat.